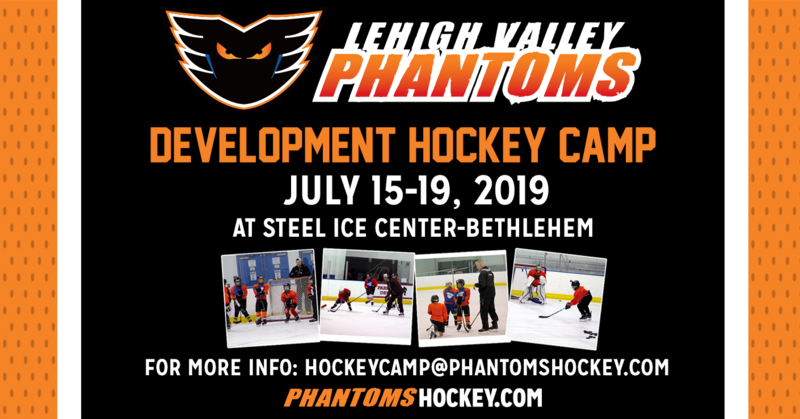 The Lehigh Valley Phantoms will host their annual Youth Development Hockey Camp July 15 through 19 at Steel Ice Center in Bethlehem, Pennsylvania. Now in its third year, the Phantoms Hockey Camp features both on and off-ice instruction by Lehigh Valley Phantoms Head Coach Kerry Huffman and Phantoms Manager of Hockey Operations Bill Downey. The Phantoms coaching staff will instruct camp attendees in a number of areas including: power skating, puck handling, positioning, speed training and more. Both lunch and drinks will be provided for camp attendees and each enrolled player will receive a camp jersey as well. This fun and challenging camp offers a chance to learn from the pros and also includes special appearances by Phantoms players throughout the week-long camp. Ready to sign up? Complete the online form and submit payment by clicking HERE.